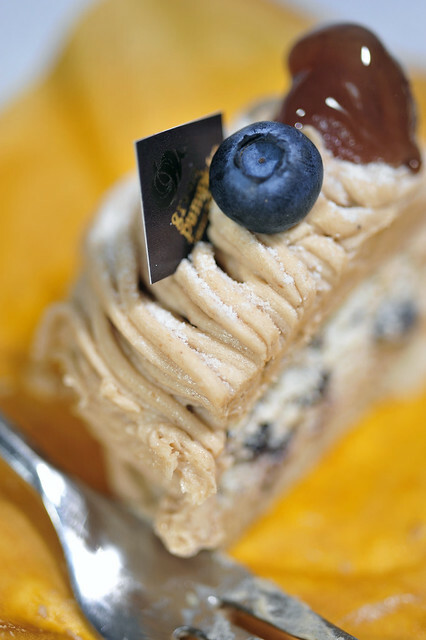 First up is Mont Blanc, the pièce de résistance of French pastry making for many many Japanese dessert lovers. 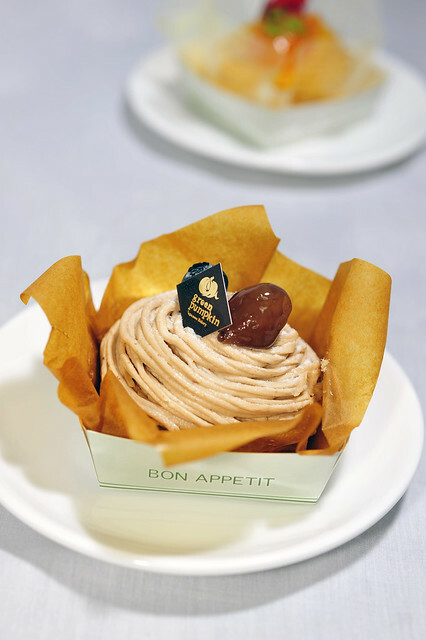 In fact, its so popular in Japan that I don’t recall visiting any patisserie during our trips to Japan that did not have Mont Blanc in some version or another. Perhaps this stamps from how the Japanese love chestnuts 栗 (kuri), extensively using it in cooking and wagashi making. Green Pumpkin’s rendition was pretty standard in appearance, spaghetti strands of chestnut puree and paste-infused cream that spiral to form the prototypical molehill which was then gently dusted with “snow powder” and embellished with a shard of marron glacé and a single blueberry. The base is made from a cut of disc of sponge, probably joconde. The chestnut cream had a slightly overt sweet edge, tipping the scale a little on the heavy side but still acceptable for me. What I found severely lacking is in the department of aromatics. The piece was not perfumed as it should be, either from candied or roasted chestnuts, or from a dash of liqueur. The latter is pretty understandable as it was probably taking into consideration very young or Muslim customers. Nonetheless, I personally felt that it missed a chance to shine and would probably have added a generous splosh of crème de châtaigne or even rum/cognac for that extra oomph. The texture of the chestnut cream was also rather disappointing. Could have been been made more interesting with tiny morsels of roasted chestnuts to break the monotony and for that smoky effect. But this has to be delicately balanced as it should not be misinterpreted as chestnut cream which hasn’t been processed finely enough. One should still be able to discern between the two. What was most bizzare for me about the whole piece, was the incorporation of morsels of blueberries in the crème chantilly in the middle. Was it because the fruit was in season then and cheaply widely available? Or was it because its designer felt that the fruity and slight spicy tones from blueberries could add dimension to the overall palate experience? Or was it simply because marron glacé was too lavish given the price one’s paying for the piece? I have no answers but for me, blueberries simply doesn’t make the cut and left much to be desired. Put bluntly, it “cheapens” the whole thing. The composition of the piece is similar to the prototypical chestnut Mont Blanc, save for the hidden surprise in the middle, i.e. 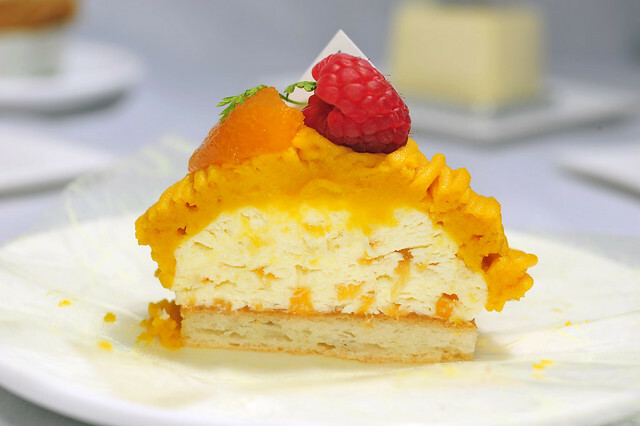 crème chantilly packed with morsels of finely chopped dried apricots. The latter has an almost jelly bean like texture, soft and chewy but not too hard. 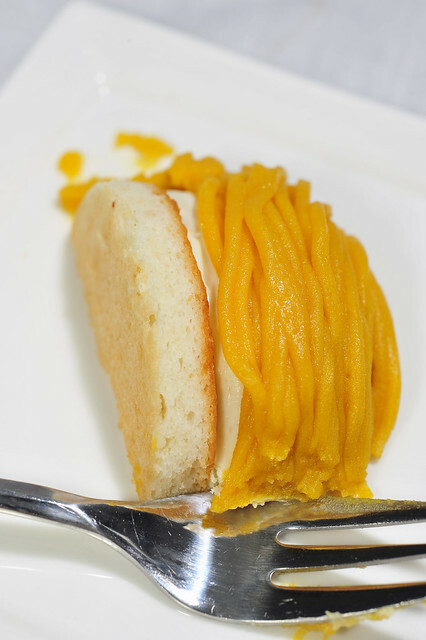 The slight hint of sourness from the bits of apricot was most certainly something which one wouldn’t have thought of, but in retrospect, amalgamated fairly well with the sweet pastry cream. I’d always loved the earthy tones from vegetables like sweet potatoes, yam and now pumpkin. 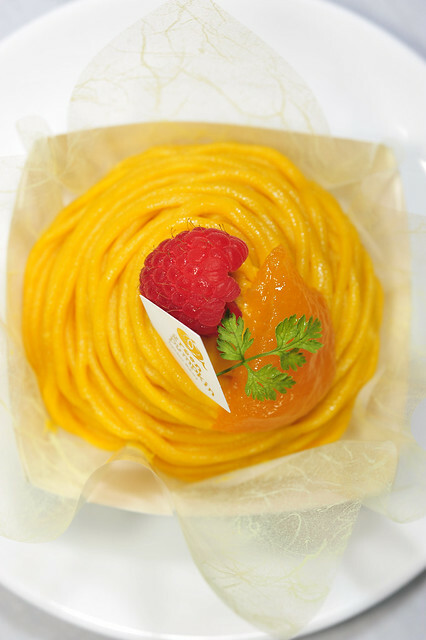 Their sweetness is often subtle and not overtly jarring, likewise in the green pumpkin spiral topping. Unlike the earlier piece, the pumpkin cream was not overtly sweet. So for me, this piece came together much better than Mont Blanc itself. Quite an irony I know, but ain’t life full of it to start with? 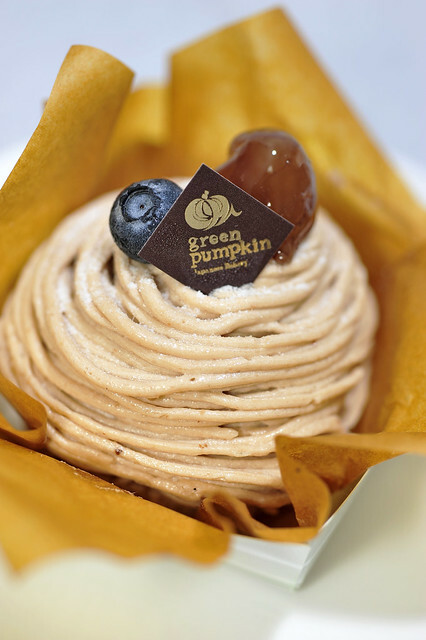 In short, I would say yes for the green pumpkin Mont Blanc but no for the prototypical chestnut one. Green Pumpkin Japanese Bakery is really quite unique in its own right. Never in a local confectionery/bakery/patisserie have we seen and tasted such an extensive use of Japanese inspired ingredients, many of which have their roots in traditional wagashi making. Apart from the usual run-in-the-mill tsubushi’an (red bean paste) and kurogoma (toasted black sesame) used in an-pans, the pastry chefs also ventured to incorporate other flavours like yuzu, satsumaimo (sweet potato), kubocha (Japanese green pumpkin), sakura no hana (pickled cherry blossoms) as well as sakura’an, i.e. shiro’an (white bean paste flavoured with pickled cherry blossoms), as well as matcha into their works. Quite a feat if you ask me and thus needs to be encouraged. This entry was posted on February 11, 2012 by Alan (travellingfoodies). 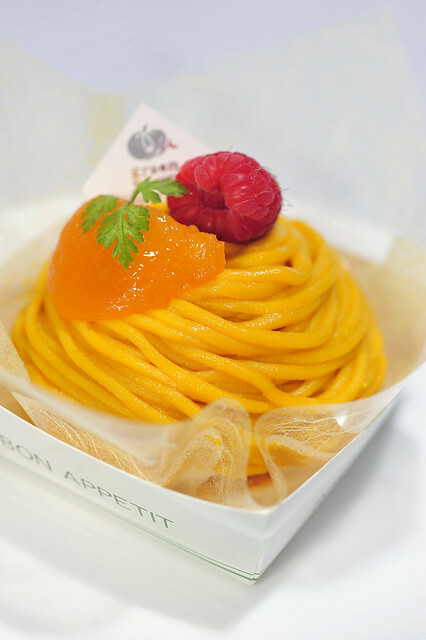 It was filed under Food and was tagged with apricot, モンブラン, blueberry, chestnut cream, confectionery, green pumpkin japanese bakery, kubocha, Marron Glacé, mont blanc, pâtisserie, raspberry, sponge. Nick from Pavé Chocolates here. 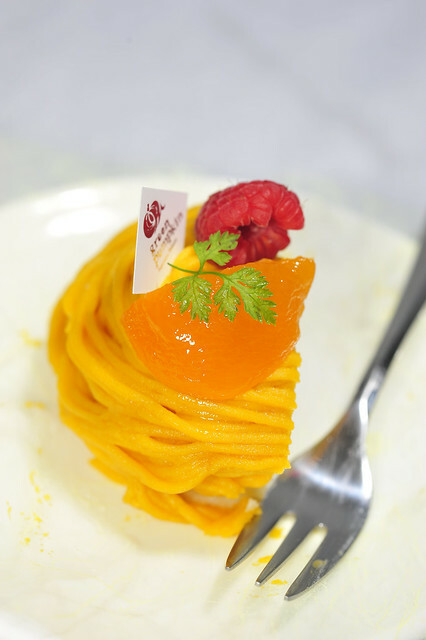 Did you perchance try our ‘Signatures’ when you visited us? 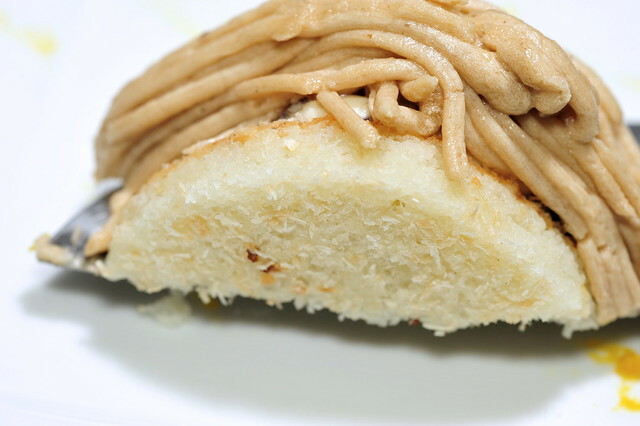 Its not a Mont Blanc, but our take on a Chestnut cake. Along with Chestnuts from France (We import it ourselves) and chestnut bits inside, its matched with a beautiful aged Armagnac and single plantation chocolate to give it sophistication and punch. Its not cheap ($9.50), but we believe once you taste it, you will understand why! Hi Nick! Thanks for dropping by! Yes I believe we’d sampled the chestnut cake you’d mentioned. Its the one assembled in a tapered chocolate vessel yeah? It was wicked alright! Regrettably we didnt have our camera with us when we’d tried it. Definitely looking forward to having it again soon! Same with the chocolate tart topped with candied citrus morsels and pink peppercorns! I’m having a craving for that, now that you’d reminded me. 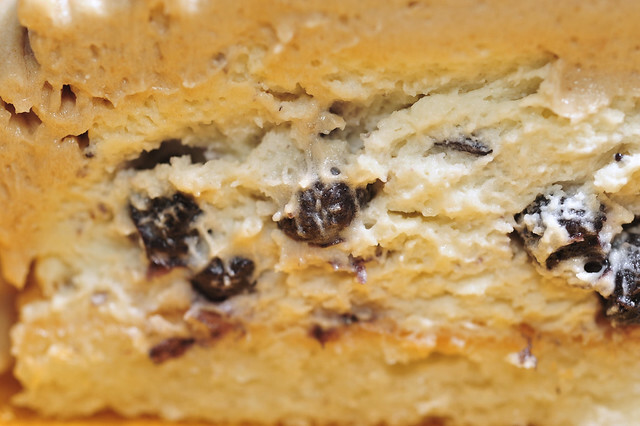 About the chestnut cream, I’ll probably consult you personally when I visit Pavé again! Something totally random here, I almost banged my head on the wall when I knew that you are gonna conduct chocolate intro classes at Palate Sensations and I can’t attend! Severe time clashes. Boohoo! Any chance of a class at Pavé? Lots to learn from Yen and you! hi alan, how are you? both mont blancs look pretty tempting and the way you described it, the green pumpkin mont blanc is surely something very extraordinary with apricots and a yellow mont blanc does look more appealing too! is this their signature mont blanc? Hi Lena! I’m good thanks! 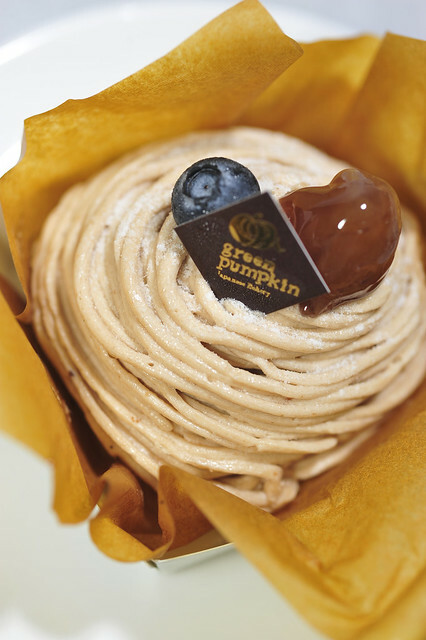 I’d much much preferred the green pumpkin Mont Blanc over the typical chestnut one. The latter didnt work for me as well as the kubocha one. And yes, the colours are indeed much more appealing! Hi Alan, Very interesting bit about the blueberries, do you not like blueberries or was it truly a misplaced addition? 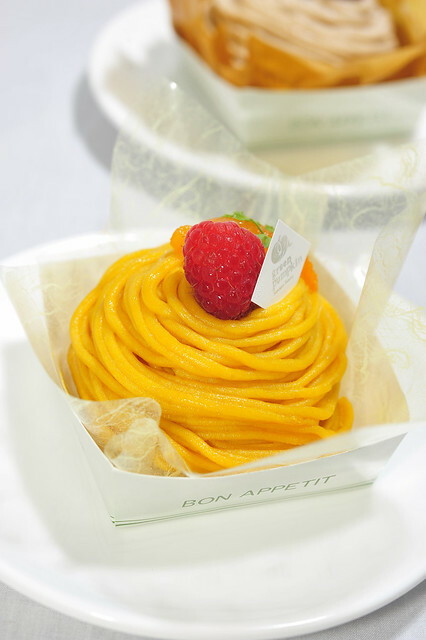 I agree with everyone else, the pumpkin mont blanc not only looks wonderful (great colors!) but the way you describe it….I can almost taste it! yeah, I felt that the blueberries were a bit out of the way. Doesn’t look like it was meant to be there. Just happened to be so as that was what they could find. Then again, I’m just guessing.